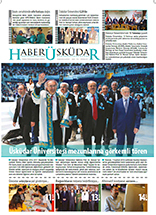 News Üsküdar is the implementing newspaper of the Faculty of Communication, New Media and Journalism Department students. Our students take the first steps to the profession with this newspaper; from news gathering and make a page design. The main goal of the newspaper is to prepare students for the journalistic profession in the most appropriate way and ensure that they graduate in an internalized way of professional as well as ethical values. The newsletter includes university news and other news-related topics, interviews and research-analysis articles. In News Üsküdar, students studying in other departments of the Communication Faculty and students who are interested in journalism can also be correspondents.